Friday last week I went to London to check out rehearsals for our production of the interestingly named play Horse Piss For Blood by Carl Grose. Summing up the play in a sentence is tricky, but I’ll try. Set in the hamlet of Nancekuke, Cornwall; Horse Piss For Blood is about Cornish conspiracy theory, the legend of The Owlman, MOD chemical weapons and a 50-something white Rastafarian woman’s slightly dysfunctional family. It’s also VERY VERY funny. 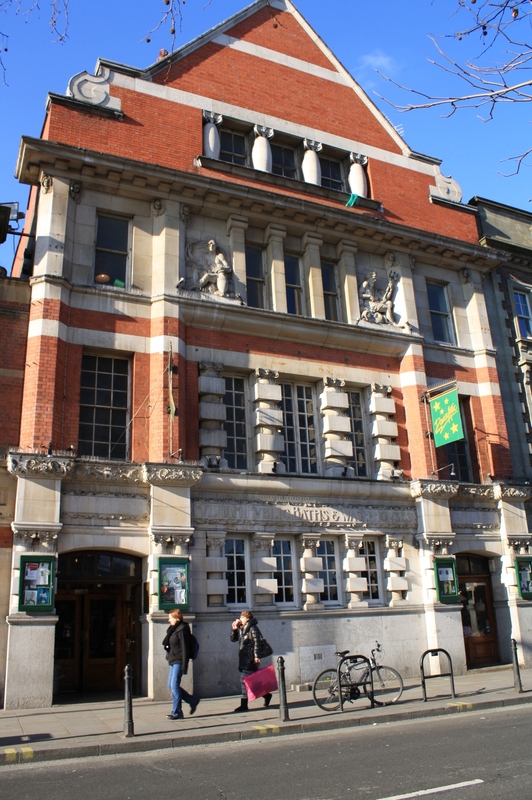 I arrived at the Dance Attic rehearsal space in Fulham; a beautiful old building that was once old Victorian baths and still smells a little like a swimming pool. It was all very Fame Academy – lots of people milling about in leg-warmers, sipping Evian and ginger tea. Upstairs, a girl band were rehearsing routines in front of the mirror, singing into hairbrushes. Yes, really. I’d not been to professional rehearsals before. I kind of expected a lot of actors pacing the room, projecting vowel sounds (ayyyyyyyyeeeeeeiiiiiioooooooyyuuuuu) whilst a stage manager furiously scribbled notes in deadly silence. How cliché. And not true at all. As I snuck in, the play Director Simon Stokes (who is also the Theatre Royal Artistic Director) and Company Stage Manager Sarah were discussing – rather amusingly – the effects of snorting glucose. (In one scene, it needs to appear to the audience that one of the actors is taking cocaine.) According to Sarah’s research, either glucose or icing sugar is the actor’s fake-cocaine-of-choice as it is harmless and has no side effects. Although Sarah did confess to having a little sugar-high after testing it out! Hanging on the walls of the room were lots of printouts relating to the play, The Owlman, Nancekuke, MOD chemical weapons, Bob Marley – any kind of reference to the text – as well as photos of the set model. The Drum stage had been taped out on the floor to scale, including all entrances and exits and fundamental scenery. Simon was blocking out one of the earlier scenes in the play and this to-scale layout made it easier for everyone to have an understanding of where everything is and where they need to be. I’d read a few drafts of the play but areas were still in the process of being rewritten – which is often the case for new work. However, I still had a good idea of the plot and characters. A seemingly obvious statement to make; but the difference between chuckling over a few lines in the script, and then seeing it brought to life by some really talented actors that have me guffawing ridiculously through rehearsals, was unbelievable! The cast just seemed perfect, like the parts were written for them. Phil, (who was in our last collaboration with Carl Grose, Grand Guignol) is a natural comedy actor. Every time they ran the scene he seemed to do it slightly differently and it made me laugh each time. Actors like him help productions remain fresh throughout the run. I was surprised by the overall relaxed atmosphere of the process. Simon worked quietly and methodically, the cast were focused but not without the odd unrelated giggling fit and the Stage Management team quietly went about noting stage directions, planning the tour, paying wages or magically producing a new prop. At lunchtime the cast took the time to wind down a little or learn lines. I gate crashed their peace and quiet and chatted to Alex who plays Virgil Ploy (fantastic character name!). Alex grew up in Cornwall, not too far away from Nancekuke where the play is set. I asked him if he believed in The Owlman, one of the legends woven into the play. Despite the absurdity of the myth – every cast member I asked said that they believed in The Owlman. Perhaps it’s me that needs keep my eyes shut tight at night. I didn’t take too many photos whilst I was there – actors, strangely, are a shy bunch but these might give you a some idea of the rehearsal room. In a few days I’ll be posting a teaser video we’ve had made – it’s pretty awesome…! But in the meantime, here’s some links to the relevant myths and conspiracy theories, in case you’re curious.